A landmark coal-fired power station in West Yorkshire has officially closed after 50 years in service. The closure of Ferrybridge C, near Knottingley, was announced by SSE in May 2015. It last produced electricity on 23 March. Decommissioning work will begin following the closure and is expected to take about 12 months. SSE said a projected loss of £100m over the next five years meant Ferrybridge was "no longer economical". Image caption The power station began generating electricity on 27 February, 1966. Harry Ellis, councillor for the Knottingley ward, worked at the Ferrybridge site from 1963 to 2008. He said: "People are just so used to it being there; for some it has been there all their lives. "It has had a vast impact on the local area. "It has been my entire working life, the power industry, and it will be a big change when it goes." More than 170 people were working at Ferrybridge C when SSE announced plans to close the power station. A spokesman for the firm said the majority have either found alternative jobs within SSE or will stay on to help with the decommissioning phase. The power station is situated on the River Aire and is the third coal-fired power station to be built on the site since 1924. It began generating on 27 February, 1966. Since it opened it has produced an estimated 462 Terawatt hours (TWh) of electricity - enough to power the entire nation of France for a whole year. It has two 198m (650ft) high chimneys and eight 115m (380ft) high cooling towers - the largest of their kind in Europe. In 1966, during construction of Ferrybridge C, three of the cooling towers collapsed in high winds. In 2014 a major fire at the power station caused the partial collapse of a tower on the site. Mick Gee, station manager, said: "In the eight years I've been station manager I'm proud to have worked with some amazing people. "I want to acknowledge the contribution from all those who've been part of the Ferrybridge family, past and present. "It has always been a special place to work, where people help each other without asking." 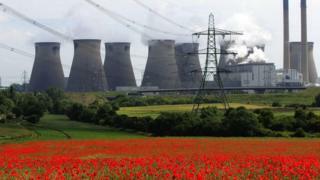 Yvette Cooper, Labour MP for Normanton, Pontefract and Castleford, said closing the power station was a "bad decision". She said: "This is grim news for Ferrybridge, for Knottingley, for the area, because I think it's a bad decision by SSE. We need the energy capacity for the country and we need the jobs in our area." A multi-fuel "waste-to-energy" plant opened at the Ferrybridge C site last year and construction of a second multi-fuel station is due to begin later this year. In November the government announced the UK's remaining coal-fired power stations will be shut by 2025. Cooling towers: Eyesores or sights for sore eyes?